This week: "The world's first OLED lamp," New York's vanishing neon signs, and high-power GaN-on-Si LEDs from Toshiba. Toshiba Electronics Europe has announced new members of its Leteras family of white GaN-on-Si LEDs. Devices in the TL1L3 series are 1.0W LEDs with a Vf of 2.85 V at 350 mA and a fooprint of 3.5 x 3.5 mm. They are available in CCTs from 2,700K to 6,500K, with luminous efficacies of 112-145 lm/W across that range. They have a CRI of 80. (The R9 is not given anywhere I could see.) Here is Mouser's listing, showing a unit price of 63.8 cents at 9,600 quantity on reels. LG Chem is touting what it calls "LED-level" OLED panels that operate at 100 lm/W with a 40,000-hour lifetime (LT70). OLED-Info's writeup allows at least a rough price calculation. LG Chem's current crop of 60 lm/W OLED panels runs $600 per kilolumen, or about $45 for a 10 x 10 cm panel. The 100 lm/W version should be more like $15 per panel when it is available late this year. ‣‣ "The world's first OLED lamp"
Aerelight Design Studio is trumpeting the development of what it calls the first consumer-level OLED "lamp." 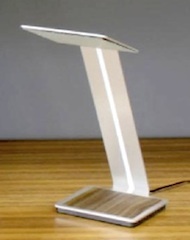 (The company means luminaire; it's actually a desk lamp.) It will cost $269. You can pre-order now in silver, red, or black, but I couldn't find an estimated shipping date anywhere. No details are given on the specs of the "warm, natural light" the Aerelight emits. The Aerelight has a couple of neat tricks up its sleeve. The body is a single piece of anodized aluminum, and control for both on/off and dimming is effected by touching it anywhere. The base contains a charging station adhering to the Qi Wireless charging standard, which can charge a number of Android phones (and iPhones via extras such as a Qi-compatible protective case). Let's digress for a moment from general-purpose lighting. LED lighting is now defining the look of 21st-century cityscapes, just as neon lighting set the tone in the early 20th century for a gritty urban vibe. New York University's NYULocal.com is running a feature on New York City's vanishing neon signs. A couple of books on the subject have come out in recent years, and a blogger community keeps the issues of heritage and preservation alive for New Yorkers. 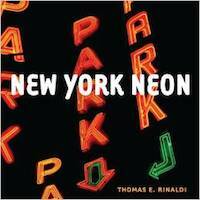 Thomas Rinaldi's 2012 book New York Neon (cover shown) informs us that, of the more than 100,000 neon signs installed in Manhattan between 1916 and 1960, only a few have been preserved in private collections or museums. Like most cities, New York never codified rules about preserving its characteristic neon. In the absense of such regulations, simple economics will dictate its fate. Neon's luminous efficacy is less than 10 lm/W, and repairing such a sign today typically costs more than ordering a new and efficient fluorescent- or LED-powered one.